Rhode Island Historical Tracts is a series of booklets published by noted Providence bookseller and antiquarian Sidney Smith Rider from about 1875-1900. 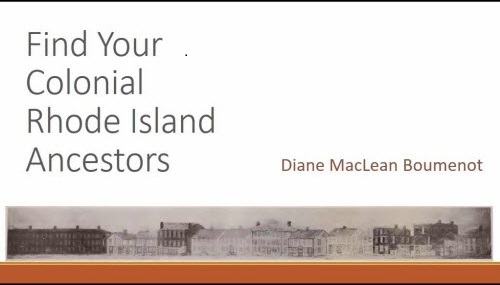 Some are print editions of manuscripts, some are compiled reports, and some are an overview of a subject (such as Rhode Island currency) of interest to historical collectors. There are even a few genealogies in there. I have used a few volumes over the years, but recently recognized that they were published as a series, and that there is even a separately published index for the first 20 volumes. Talk about your underutilized genealogical resources; that index might top the list. It is #20 below, in red. Don’t forget to check villages, churches, and streets in the index, as well as names. A collector and dealer in historical ephemera as well as books, Sidney S. Rider was well positioned to recognize interesting or controversial historical information and make it available to the public. Brown University holds in its Special Collections Rider’s lifelong collection of historical tracts and ephemera, The Rider Collection, which has a particular focus on Thomas Dorr. Opinionated and prone to scathing criticism, Sidney Rider was also known for his periodical Book Notes. A closer look at Mr. Rider’s life is available at this blog post from the Providence City Archives. What captured my interest in Mr. Rider’s work was his introduction to Tract 10 “An Historical Inquiry Concerning and Attempt to Raise a Regiment of Slaves by Rhode Island During the War of the Revolution.” Clearly, he questioned things. This State has been highly commended by several writers for having inaugurated and continued the policy of employing slaves and negroes to fill her quotas in the Continental Army during the War of the Revolution; and much has been written in our histories touching the services of these slave soldiers in battle highly creditable to them. How far these statements are in accordance with the facts in the case, is the purpose of this inquiry. With this end in view the writer has first given many extracts from former writers relating to the case. These are followed by the laws under which the battalion was formed, and by documentary evidence concerning its service. These in turn are followed by lists of the slaves which were purchased, and by notes concerning several of them. They seem never to have received the bounty which the law, under which they enlisted promised to them ; a pretext being set up that their liberty was given to them in lieu of bounty. Nor do they appear ever to have received the allowance given the white soldiers for the depreciation of the money in which they were paid. Finally it appears that they were deprived of large sums due them as wages by means of forged orders. In fact the frauds perpetrated upon them seem to find a parallel in the immense frauds which took place on the formation of the Fourteenth Rhode Island (colored) Regiment in the late Rebellion. All links, below, are to the corresponding Internet Archive page; from there a pdf can be viewed or downloaded. Volume 20 is on HathiTrust. 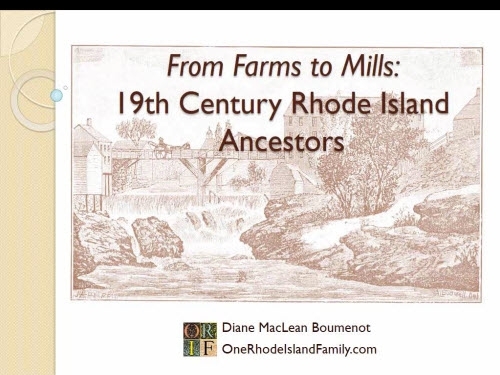 Cover of Rhode Island Historical Tracts Series 1, No. 12. Courtesy of HathiTrust. The Capture of General Richard Prescott by Lt-Col. William Barton: An Address Delivered at the Centennial Celebration of the Exploit at Portsmouth, R.I. July 10, 1877. By J. Lewis Diman. Providence: Sidney S. Rider, 1877. Visits of the Northmen to Rhode Island By Alexander Farnum. Providence: Sidney S. Rider, 1877. The Wanton Family By Sidney S. Rider. Providence: Sidney S. Rider, 1878. William Coddington in Rhode Island Colonial Affairs By Dr Henry E. Turner. Providence: Sidney S. Rider, 1879. Memoir Concerning the French Settlements and French Settlers in the Colony of Rhode Island By Elisha R. Potter. Providence: Sidney S. Rider, 1879. The Centennial Celebration of the Battle of Rhode Island at Portsmouth, R.I. August 29, 1878. The Oration by Ex-United States Senator Samuel G. Arnold; A Letter of Sir Henry Pigot, the English Commander; a German Account of the Battle; The Views of General Lafayette. By Sidney S. Rider. Providence: Sidney S. Rider, 1878. The Journal of a Brigade Chaplain in the Campaign of 1779 Against the Six Nations Under Command of Major-General John Sullivan by the Rev. William Rogers, D.D. Providence: Sidney S. Rider, 1879. Some Account of the Bills of Credit or Paper Money of Rhode Island from the First Issue in 1710, to the Final Issue, 1786. By Elisha R. Potter and Sidney S. Rider. Providence: Sidney S. Rider, 1880. Early Rhode Island currency from Rhode Island Historical Tracts, vol. 8. A True Representation of A Plan Formed at Albany, in 1754, for Uniting All the British Northern Colonies, in Order to Their Common Safety and Defence by Stephen Hopkins with Introduction and Notes by Sidney S. Rider. Providence: Sidney S. Rider, 1880. An Historical Inquiry Concerning an Attempt to Raise a Regiment of Slaves by Rhode Island During the War of the Revolution. By Sidney S. Rider. Providence: Sidney S. Rider, 1880. Bibliographical Memoirs of Three Rhode Island Authors. Joseph K. Angell; Frances H. (Whipple) McDougall; Catharine R. Williams. To which is added The Nine Lawyer’s Opinion on the Right of the People of Rhode Island to Form a Constitution. By Sidney S. Rider. Providence: Sidney S. Rider, 1880. The Medical School formerly existing in Brown University, Its Professors and Graduates. Charles W. Parsons, M.D. Providence: Sidney S. Rider, 1881. Graduates of the early Brown Medical School, from Rhode Island Historical Tracts, vol. 12, p. 58. The Diary of Thomas Vernon [1715-1784] A Loyalist. Banished from Newport by the Rhode Island General Assembly in 1776. To which is added the Vernon Family and Arms and the Genealogy of Richard Greene of Potowomut. With notes by Sidney S. Rider. Providence: Sidney S. Rider, 1881. Roger Williams’s “Christenings Do Not Make Christians” 1645. A long-lost tract recovered and exactly reprinted. Edited by Henry Martyn Dexter. Followed by certain Letters Written by Roger Williams. Providence: Sidney S. Rider, 1881. The Planting and Growth of Providence illustrated in the Gradual Accumulation of the Materials for Domestic Comfort, the Means of Internal Communication and the Development of Local Industries. By Henry C. Dorr. Providence: Sidney S. Rider, 1882. A Looking Glass for the Times or the Former Spirit of New England Revived in This Generation. By Peter Folger. Providence: Sidney S. Rider, 1883. A Defence of Samuel Gorton and the Settlers of Shawomet by George A. Brayton. Providence: Sidney S. Rider, 1883. Gleanings from the Judicial History of Rhode Island. By Thomas Durfee. Providence: Sidney S. Rider, 1883. Stephen Hopkins, a Rhode Island Statesman. A Study in the Political History of the Eighteenth Century. By William E. Foster. Providence: Sidney S. Rider, 1884. Additions and Corrections to the first series of Rhode Island Historical Tracts: With an Index to the Same. Providence: Sidney S. Rider, 1895. Note: unless you have a Hathitrust login, you will have to use this volume on the site. It opens slowly. 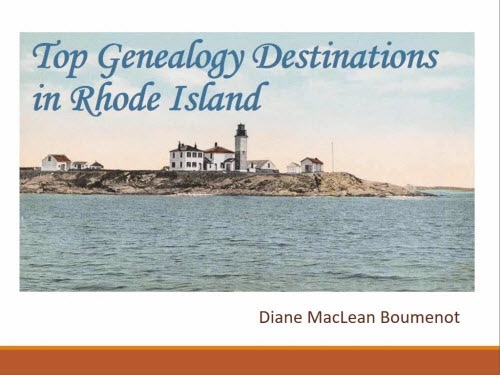 Don’t miss the helpful index to Series One, Rhode Island Historical Tracts. It is contained in Volume 20, along with corrections to v 1-19. An Inquiry Concerning the Origin of the Clause in the Laws of Rhode Island (1719-1783) Disfranchising Roman Catholics. By Sidney S. Rider. Providence: Sidney S. Rider, 1889. An Inquiry Concerning the Authenticity of an Alleged Portrait of Roger Williams. Providence: Sidney S. Rider, 1895. A Century of Lotteries in Rhode Island 1744-1844. By John H. Stiness. Providence: Sidney S. Rider, 1896. Many of the lotteries shown in Rhode Island Historical Tracts, Series 2, num. 3 were church-related. This ticket for the Second Baptist Society’s Lottery in Coventry was evidently acquired with a scrawled note from Jonah Titus: I purchased this ticket very much against my views of interest but like him who gambles in anything else hope to gain by it. The Forgeries Connected with The Deed Given by the Sachems Canonicus and Miantinomi to Roger Williams of the Land on Which the Town of Providence was Planted. By Sidney S. Rider. Providence: Sidney S. Rider, 1896. Soul Liberty. Rhode Island’s Gift to the Nation. An Inquiry Concerning the Validity of the Claims Made by Roman Catholics that Maryland was Settled upon that Basis Before Roger Williams Planted the Colony of Rhode Island. By Sidney S. Rider. Providence: Sidney S. Rider, 1897. Diane, as always, a very informative and entertaining post! If I could “like” it a dozen times, I would. Great job! Diane, I admire your ability to turn up the most interesting items and bring them to light! The tracts were of particular interest to the Portsmouth Historical Society as we prepare for this season’s exhibit about the history of the Christian Union Church, the building in which we are housed. The church raised building funds in mid-1800’s through a lottery and in the tract on lotteries–bingo!–an image of one of the lottery tickets. It makes a wonderful addition to our exhibit. That’s amazing, Anne. I was surprised to see those church lotteries, and I suspected others would be surprised too. If nothing else, I think Mr Rider was good at guessing what people might find unusual about our little state’s history. Thanks for posting this listing. I don’t have any connection to Rhode Island but I found a couple of things to read through — The Northmen in North America and the essay of Roger Williams regarding Christians and the Natives. I’ve always been a history buff and these really peaked my interest. Thanks so very much for sharing – I love it. Karen I got a kick out of the “Northmen” story too. I’m a native Rhode Islander and it’s something I’ve never thought about. The author didn’t seem to find much, but I enjoyed reading it. Thanks for visiting!